Welcome to the Perunapedia; your one stop for all things related to SMU's mascot Peruna. Whether you're a prospective student or a long time alum, it is my hope that you find something value here. Please feel free to use the "Contact" form to the left to let me know what you think, what I should change, or anything else you feel like communicating. 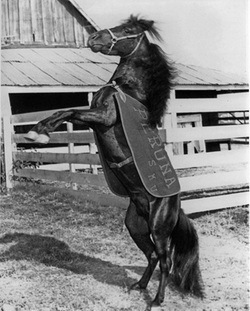 Feel free to browse through the links to your left to learn about the history of Peruna, his namesake, the Peruna Handlers, the Museum, or even browse through a 1950's children book written about Peruna. Much of what is found within this site is compiled from many other sources into one central resource for all things Peruna, and thus, the webmaster assumes credit only where explicitly stated. Recently, certain people around campus have decided that SMU needs new mascots, the two geldings known as "Liberty" and "Justice." It seems that these persons could use a little lesson on the storied history of one of the country's most famous mascots, so I encourage them to take a look through this site.